Day 5 of my Parisian adventure was again full of highlights, too many to mention really. The factor that helped day 5 stand out from the previous days (and trips) was finally relying on the Parisian metro. I was able to fit in twice the amount of site seeing and in much better spirits as I wasn't totally wet, exhausted and cold all day! I began the day by staying close to home, on the Ile St. Louis. The small island really is a self sufficient city within the larger whole and full of significant and historical hotel particuliers. Afterwards, I was able to finally visit one of these stunning mansions, the Jacquemart-Andre Museum in the 17th. I'm only slightly embaressed to admit that I've wanted to visit this stunning hotel particulier since watching the movie Gigi, where it stands in as the family home of Gaston. The rest of the day was spent wandering through the city, stopping into numerous churches (hearing the monks sing at the St Gervais St Protais was awe-inspiring), shopping at such yummy spots as Fauchon and along the Rue St Honore. During the evening, I had the pleasure of meeting noted architectural watercolorists Andrew Zega and Bernd Dams at their stylish apartment for drinks. I was interested to learn their art really is a dual effort: Bernd (with his German precision) does the drafting while the watercolor is applied by Andrew. Of course the bulk of the effort, the research, is done jointly as evidenced partly by their enviable book collection, seen in part in the first image. If you haven't already, be sure to check out their blog NOTED, linked from my bloglist on the sidebar. Also their website, architecturalwatercolors.com, is regularly updated. Look forward to future posts on all of these items! Day four started off frigidly but full of excitement: it was Versailles day! You may recall my visit nearly 2 years ago and my many many posts (and pictures!) of the chateau so I won't deluge you now but you can of course reference them through my blog search feature in the toolbar. Versailles, of course, does not change (at least not noticeably) but the seasons do. Tourist season is over and this visit was a weekday so the chateau was nearly empty - a very happy circumstance (other than the many closed areas -boo!). Another reason it was empty: the weather was positively frigid, painful to be outdoors. All the more reason to remain indoors and enjoy the beautiful views! A leisurely delicious lunch was spent at Angelina's in Versailles which included some of their famously decadent desserts. The hot chocolate IS as good as they claim and the Mont Blanc could feed a family of four for at least a week (if that family lived on sugar alone). Sinful; as was the fois gras which was probably the most delicious thing I've eaten in my entire life. Of course, no visit to Versailles is complete without a visit to the Petit Trianon, forever associated with Marie Antoinette whose bed at Versailles you see above. The Grand Trianon was also visited but it proved to be a disappointment; Not very well maintained and the interiors all date to the 19th century. However, it was interesting to see if for the history alone and great to check off my bucket list. I imagine that in more hospitable weather it is the most gorgeous garden in Versailles. On the way home, I stopped for a warming drink at L'hotel which I mentioned yesterday, the "Oscar Wilde" hotel, which was also blissfully nearly empty. Only a few colorful characters shared the lounge with me which proved for interesting people watching. I must say it is my favorite spot I have found in the city! Day 3 was off to a late (and wet) start which prevented some of my original plans (a visit to the Musee Jacqumart-Andre which was rescheduled) but was still a glorious adventure. I spent much of the day with the talented photographer Cedric Benetti, whom you may know from his fantastic blog Paris 2E (see link in my blog list). Cedric has started giving guided tours of the city, mostly spots off the main tourist beat, and with his background in art and architectural history he makes the perfect erudite guide. See information on his many tours at http://palaisroyalgrooming.blogspot.com, I can't recommend him highly enough! Highlights included the Opera Comique,tea at Le Grande Hotel across from the Opera Garnier (the Inter-Continental), an insider tour of the Ecole des Beaux Arts (where the architectural profession was born, so dear to my heart), the Louvre (where Cedric studied) and finally a walk through St. Germain des Pres. One of my favorite spots we saw today was L'hotel, also known as the Oscar Wilde hotel. Impossibly charming, right in the heart of St Germain, the hotel's restaurant is one which I plan on visiting later this week and hope to stay during a future visit. Tomorrow, Versailles and I'm so excited to visit it again that I doubt I will be able to sleep! And lots of luxurious shopping. The windows of Christofle really took my breathe away - clouds holding their goods above the rooftops of Paris, so clever! The Egyptian styled monument outside of the Theatre du Chatelet was magnificent, but really, who doesn't love a sphinx or four! I arrived in Paris at the crack of dawn, literally, as the sun rose behind Notre Dame. Coming from the airport via the RER has the benefit of having your first view of Paris being this spectacular cathedral high above the Seine. I'm staying in an apartment behind Notre Dame on the Ile St. Louis, right in the heart of the city. After just one day I can thankfully say that apartment living is the right way to travel, I feel right at home. The apartment sits on the top floor of an old courtyard building: very La Boheme-esque complete with skylights and myriad stairs! As you can see though, it's not a bad way to travel! I love the time worn marble treads and beautiful iron railing. The first day has been homey with naps, trips to the local wine and cheese shops, tea at Mariage Freres and flowers from the local florist, naturally! I'll be checking in with daily highlights so stay tuned! Green Valley Christmas Trees was kind enough to send me one of their fresh 22" Douglas fir Wreaths -such a beautiful scent from my mailbox! 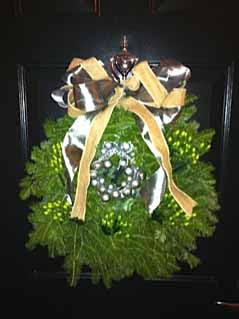 I gave the wreath to my friend, interior designer Sally Steponkus, to work her magic. 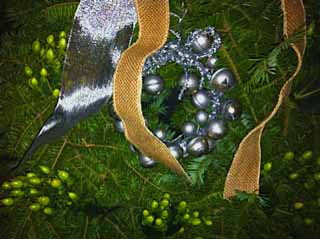 She used a a mini-wreath of silver jingle bells inside and fresh hypernicum berries. The ribbons are a rustic/glam combo, a look she loves ( and I do too! ). I hope this gives you inspiration for your own holiday decorations!